One of the biggest struggles Christians have is the ability (or inability) to hold two opposing views in tension. Whatever the issue, some see the right or wrong so clearly that they leave no room for alternate interpretation. The other extreme is equally true. Often triggered by a reaction to its opposing viewpoint, this view sees the same issue from the lens of Self-Importance. The sad state of many Christian discussion groups is that they have practiced a warped version of Ephesians 4:29. More often than not, instead of "building others up according to their needs," they are essentially puffing themselves up according to their pride. Few people are able to hold both views in tension, to boldly attempt to see both the pros and cons of both perspectives. Even fewer are able to wait patiently to see God's perspective not just on the issue, but our role in bridging the gap and loving people more than our own pet arguments. When the arguments are hot, this a gentle and forgiving attitude is hard to find. In the hurry to make our views known, we unwittingly put down our brother/sister's equally legitimate points. For example, after a politically correct "I know what you mean BUT, ....." the rest is essentially parading one's convictions, one's opinions, and sometimes an entire treatise of one's philosophy or theology. Perhaps, this is one of the flaws of any society that prides itself as being efficient and effective. Not getting a result or an answer by a certain set time seems more like failure. If time and tide waits for no man has a debate equivalent, it will be, "my time and my tide seems more important that other people's time and tide." Call it a disease of the individualistic society. Call it a self-seeking paradigm that is so pervasive in society. Call it selfishness that puts one's own interest above others. This week, I completed a review of a soon to be published book, "The Fruitful Wife." As a pastor, I deal with so many different kinds of people, that I am learning to be open to reading on materials that also concern my congregation. Even though that book has been written with the female gender in mind, I find the principles very applicable to all. In it, the author Hayley DiMarco asks: "What is the opposite of love?" The answer is not hatred. Neither is it unlove. It is selfishness. In the book, DiMarco allocates a chapter each to the nine attributes of love in Galatians 5. The first fruit of the Spirit is love. In contrast, she mentions an equivalent fruit of the flesh to accompany the biblical nine. The first fruit of the flesh is this: Selfishness. This is an important understanding. Some of us may dispute the literal opposite of love being selfishness. Yet, I think the essence of love is precisely this: That we see lesser of ourselves, and more of others. Pure love is desiring after the better interests of others, for others, and with others. There are ample biblical support for this. See the references below. Note how Paul talks about our speaking to help others up rather than help ourselves first. See how we are urged to build others up and not puff ourselves up with self-knowledge and self-understanding. See how intent he is in meeting the needs of others, and not trumpet our own pet thoughts and selfish desires. Moreover, the other-centered practice of Christian spirituality is not something we can do on our own strength. We need God. Do you remember the texts prior to Jesus' call for us to love one another? Before there is John 15:17, there is John 15:5. Perhaps, we can use a metaphor for our tendency to imagine things. 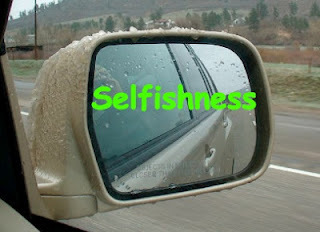 Selfishness is like our side mirrors of our car. Objects typically are closer than what we see. We are more selfish than we think. The more selfish we are, the more difficult it is to go through a detoxification process. One of the most important marks of a Christian is how they are spending time. In fact, the quality of one's relationships with people, is heavily linked to the quality of one's relationship with God. Otherwise, we learn from all the wrong sources. We deceive ourselves. We behave badly. When that happens, we can easily become big-headed or prideful for our own good. That is when we need to release some intellectual puffiness under the cautionary, "Oops. I may be wrong." One more thing. Someone has said that humility is not thinking less of ourselves, but thinking of ourselves less. In a way it is true, but it needs to go farther. John Dickson, in his excellent treatise on humility, has this wise words that we can learn from. Note the three things. We need to be willing to let go of our own selfishness. We then learn to use whatever we have for the benefit of others. That is essentially putting Ephesians 4:29 to practice. 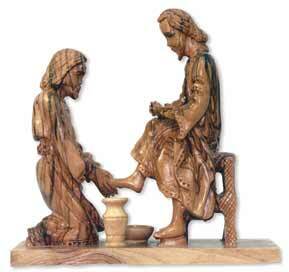 Humility readies us to start looking toward seeking the better of others instead of self. It makes us realize that by ourselves, we are always tempted to look inward and become selfish. When living and interacting with others, we are disciplined to look outward and learn unselfishness. This is particularly important when it comes to time alone with ourselves. Are we using that time to walk with God, to sense what God is speaking to us? I tweeted a few days ago, that if someone claims to love God with all their hard, why are they then only spending time with God in their SPARE time? Have we consciously or unconsciously depended on our own strength for our own good? The evidence is telling. Pop up our schedules. Are they in line with our public proclamation of our priorities? Look back over the day. What is the first thing you do when you wake up? Who is the first person you greet? Have you given thanks?